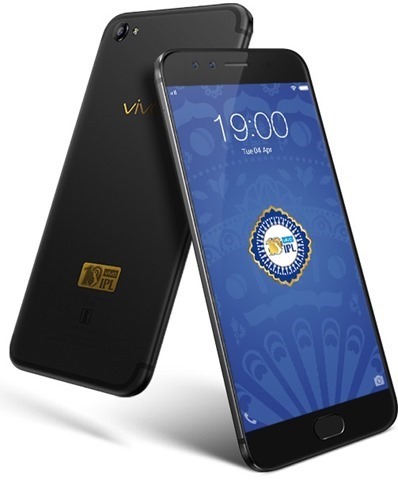 About a week ago, Vivo launched a new variant of its V5 Plus to cater to cricket fans in the Country, called the Vivo V5 Plus IPL Limited Edition. The Chinese OEM, which is the main sponsor of the IPL 2017 edition, has made the phone available for purchase from Flipkart. The key difference between the regular and limited edition B5 Plus, is the colour. The latter comes in Matte Black, and an 18-carat Vivo IPL logo on the back panel. The device features a 5.5- inch 1080p Full HD display, and runs on Android 6.0 Marshmallow, with Funtouch OS on top. It has a bluelight filter called Eye Protection Mode, and Smart Split 2.0 which offers multi-window mode. The V5 Plus IPL edition is powered by an octa-core Snapdragon 625 processor clocked at 2.0GHz, with 4GB of RAM. The phone offers 64GB of internal storage, and does not support expandable storage, i.e., no microSD card slot. There is a physical button on the front, which houses the fingerprint scanner. The photography department on the Vivo V5 Plus consists of a dual front camera set up with a 20 megapixel sensor and an 8 megapixel sensor which has an f/2.0 aperture. The rear camera is a 16 megapixel lens, also with an f/2.0 aperture, LED Flash, and supports PDAF (Phase Detection Auto Focus). The Vivo V5 Plus is backed by a 3055mAh battery, which supports fast charging. The Vivo V5 Plus IPL Limited Edition has been priced at Rs. 25,990, and will be sold exclusively via Flipkart. The only major difference apart from the colours, is that the IPL Edition is nearly Rs. 2,000 cheaper than the standard V5 Plus.